One of the best things about loving to cook is the desire I have to try new types of food. This wasn’t always the case for me, in fact when I was young, I was a pretty finicky eater. I had a specific list of foods that I knew that I liked, and it was pretty much all I was interested in eating. Now that I cook for fun, I’m usually always up for trying new foods and new ingredients. The upside to this obvious, but the ‘negative’ part to it gets a little bit more complicated. See, when I find a new food that I like, I usually get somewhat addicted to it to the point where I feel like I HAVE to have it in a regular rotation for a while-especially when it’s something that isn’t too complicated to make. This year alone I’ve had a HUGE variety of ‘food phases.’ Heck, I’m still in some of them: buffalo wing hummus (which I could make by throwing the ingredients in the food processor), oven roasted veggies, chicken schwarma wraps, Kashi Go Lean Crunch cereal smothered in vanilla yogurt, bananas and peanut butter on toast, Shiritaki Noodle & Zucchini Lo Mein. I’m telling you guys, my cravings have no shame. One of the cravings that has always stuck with me is the craving to have something sweet right after I’ve finished dinner. It doesn’t have to be something ‘too’ sweet or decadent like cake or candy or ice cream (not that those things aren’t ALL wonderful). I just want something that’s sweet enough to balance out the savory flavors from dinner, but still light enough to not be too heavy or put me in a food coma ( because I usually try to save those for the Holidays). I’d always been a fan of raw almonds, but before I started reading food blogs and cookbooks, I didn’t even know there was such a thing as almond butter. But since there seemed to be a lot of people that were fans of it, I decided to take the plunge and buy some for myself. And I was hooked. That first jar of Maranatha started an obsession with almond butter that I have yet to get over (and honestly hope that I never do). Don’t get me wrong, I’ll always love my peanut butter (after all, it is EXTREMELY cheaper), but I find that almond butter’s flavor isn’t as assertive as peanut butter’s is, and sometimes when it comes to flavors, less is more. 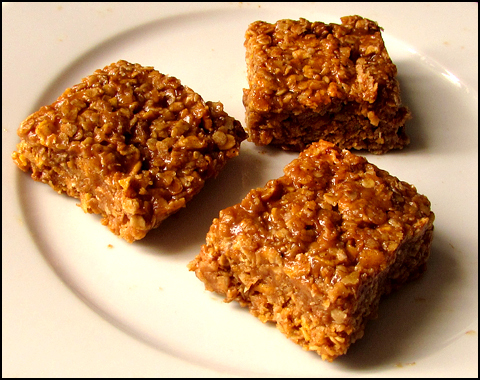 I’ve heard of and seen lots of recipes for no-bake bars that feature peanut butter in them (I’ve tried some, and they’re great), but not so much for almond butter. This recipe’s my little contribution/homage to almond butter. It satisfies the sweet tooth craving I get after dinner without making me feel too full. I’m sure that I’ll be stuck in a phase where I have to eat one at least every day for the next month or two. Another plus side to it is that the ingredients are actually pretty healthy so far as sweets go. 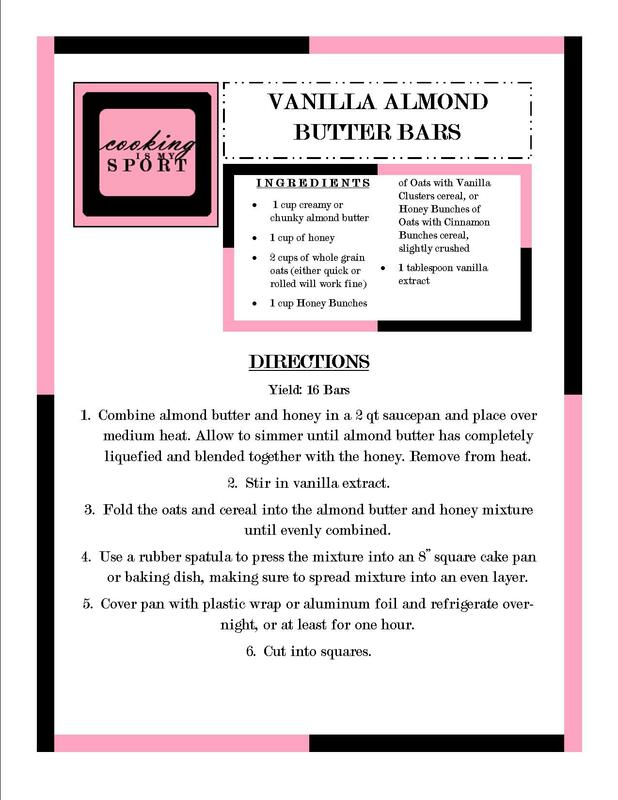 Make sure you don’t leave out the vanilla extract guys, it adds something really special to the flavor of the almond butter- plus I love vanilla flavored ANYTHING, so I’ll look for excuse to throw it in a recipe if I think it’ll work…and it did. Rather nicely, I think. 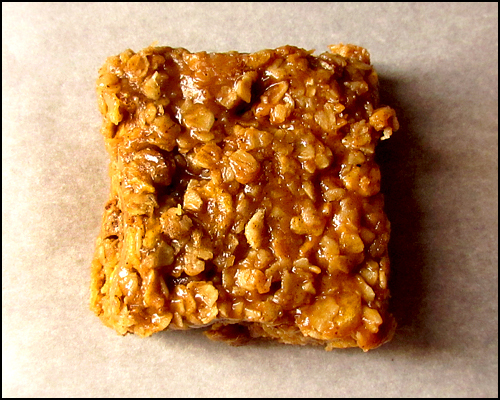 I used Honey Bunches of Oats cereal with the Quick Oats to give the bars some varying textures, but if there’s another cereal that you prefer, feel free to use it. 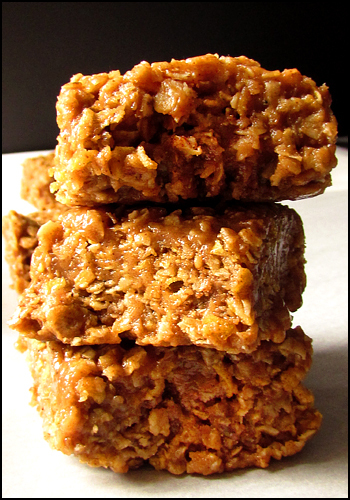 The bars are pretty versatile and ridiculously easy to make. Seriously, I think they take less than 10 minutes to put together, and a few hours to harden. So that means you literally have NO excuse not to make them. Right? Of course right. FEED(ME) BACK: What’s your favorite thing to eat when you have a sweet tooth? 1. Combine almond butter and honey in a 2 qt saucepan and place over medium heat. Allow to simmer until almond butter has completely liquefied and blended together with the honey. Remove from heat. 3. Fold the oats and cereal into the almond butter and honey mixture until evenly combined. 4. Use a rubber spatula to press the mixture into an 8” square cake pan or baking dish, making sure to spread mixture into an even layer. 5. Cover pan with plastic wrap or aluminum foil and refrigerate overnight, or at least for one hour. Pingback: How to Make Toasted Almond Butter | Mmm, Taste This!